Drum Truck is a professional-grade 4-wheel drum truck that features an exclusive design with spring-loaded chime hook that automatically engages the drum, so the operator never has to touch the drum during loading. 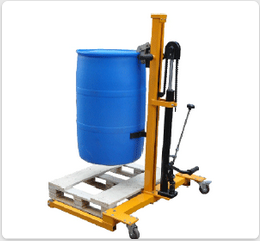 Pedal Hydraulic Drum Truck convenient auto loading drum system keeps hands off the drums for cleaner, easier loading,spark-resistant aluminum construction for lightweight safety. No need for the operator to touch the drum to raise, transport and lower.